LAKELAND, Fla. — Being a brother in blue is all about sacrifice and one Lakeland Police officer took that oath to heart — going above and beyond his call of duty. Sgt. Mark Eby, has been on the force for about 23 years. He’s been in gunfights, caught the bad guys, and saved the good ones. As a SWAT member and sergeant, not much scares Eby. “You kind of have to lead by example,” Sgt. Eby said. 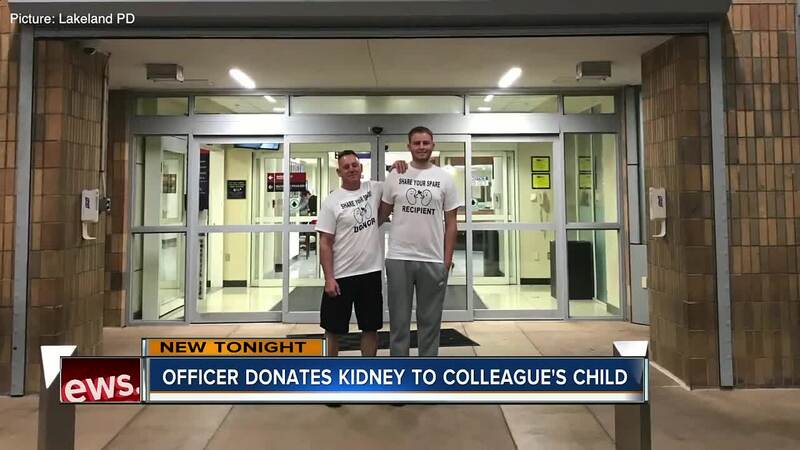 That’s why the police force veteran didn’t hesitate when his long-time co-worker of 19 years asked him to get tested as a possible kidney donor for her son. “I was like wait are you serious, you’re a match, you’re a match?” Tammy Hathcock said. The Lakeland Police Department detective was shocked after learning the news that Sgt. Eby was indeed a match, and future kidney donor, for her 20-year-old son Felix. “It’s amazing, he just did it without any questions,” Felix Hathcock, said. He was diagnosed with Kidney Disease at just 11-years-old. He says all of these years he’s known Sgt. Eby, he's learned to shoot guns with him and even learned to be an explorer under his watch. Now, Eby would be giving him a gift he could never repay. “There’s nothing that will ever be able to repay or that I co old ever say or do,” his mother Tammy, said. It’s been a month now since the operation at Tampa General Hospital and both men are doing extremely well. Now the Hathcock family have just one more request — for everyone else to get tested as a living donor. “I hope that people go out and just get the blood test. Just do the survey you have to do in order to be a donor,” Tammy Hathcock said. “Cause it can help save somebodies life,” Felix echoed. For more information on becoming a living donor visit this website .